The vehicle defense unit is an accessory for use with the Tornado defense system. This accessory is inserted into an auxiliary power outlet in your vehicle (it does not drain any power from your car battery). The rotating arm allows you to position the tornado unit any way you want so it is always ready in case of emergency. 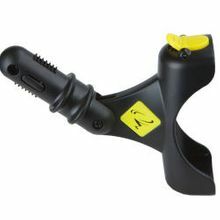 Please note: This is an accessory piece only; the Tornado Defense System w/ Clip is sold separately.